I’ve been working around the house to re-organize as my 2014 goal. I have to share this. I’ve been going to a couple different Dollar Tree stores and finding some great products to help. 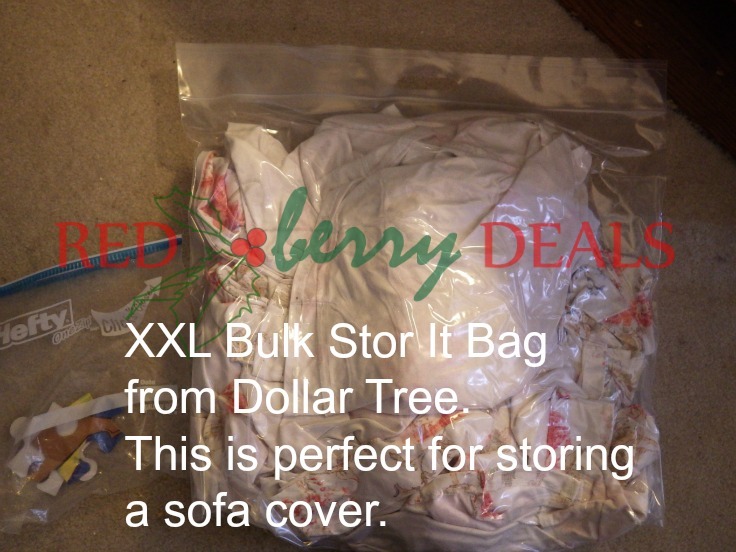 I found this XXL Bulk Stor It Bag. You can see here it is pretty big. I have it next to a regular gallon Hefty bag in the picture above. This is holding my extra slip cover for my Ektorp sofa. I can then store it under the sofa perfectly. The best part is this seems to seal better than the Space Bags that easily cost $2-$4 each. This is only $1! Imagine all of the other things you can store in these type of bags.